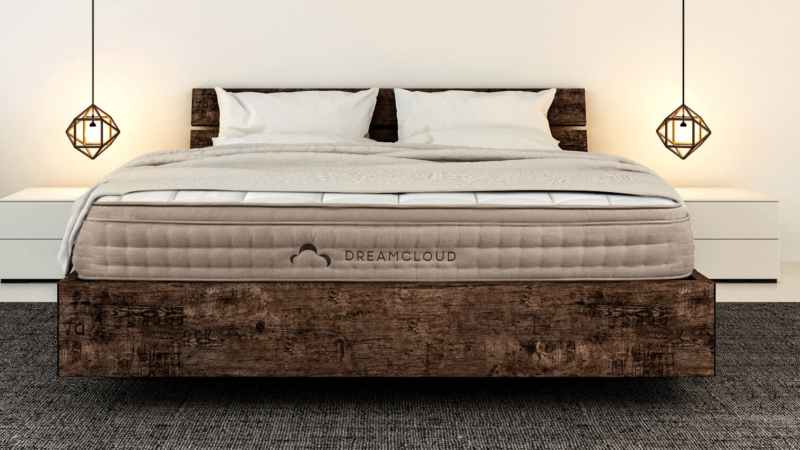 DreamCloud is a new luxury hybrid mattress brand in the online direct-to-consumer market, notable for a couple of things: an industry-leading sleep trial period, an Everlong Warranty, and the fact that the product doesn’t come with a weight limit! DreamCloud is—as company co-founder Craig Schmeizer says—“a combination… of the best of everything”; and with natural latex, high density memory foam, hand-tufted cashmere wool, pocketed coil technology and more inside every DreamCloud mattress, it’s hard to disagree with that claim. When you throw in the free optional premium services they offer with every purchase, it really starts to feel like this is the best sleep money can buy. Direct-to-consumer means that you can get a DreamCloud mattress the same way you get other e-commerce mattress companies’ offerings: by ordering it online and waiting for the rolled, compressed and packaged product to be delivered to you. However, unlike many “bed in a box” products that are about 10-11 inches thick, every DreamCloud mattress is a full 15 inches of plush comfort—with a feature-packed eight layers of material within. The cashmere blend mattress top provides softness and breathability without sacrificing edge support. Not only is DreamCloud’s cashmere blend three times more cooling that typical mattress cover materials like foam or cotton, but it’s also hand-tufted so as to avoid the use of adhesives for binding and compressing the wool. The bottom of the cover is made of simple woven cotton. As an added bonus, the cover is also naturally bedbug-resistant; and just underneath it is an FR barrier that helps the mattress meet all U.S. CPSC standards of fire resistance. The second layer is one centimeter of gel infused memory foam—but don’t let the thinness of this layer fool you! It does a lot to help with cooling and contoured support. All foams used in the mattress are approved by CertiPUR-US, as well. The four-and-a-half-centimeter third layer is also made of memory foam, although it’s uniquely quilted and developed by DreamCloud. Not all memory foams are created equal, according to DreamCloud; and they claim that their quilted foam not only sleeps cool and is breathable, but is just like resting on a cloud. The fourth layer is one centimeter of premium natural latex—resilient, responsive, and hypoallergenic. This material provides both cushion and bounce; allowing the mattress to conform better to any pressure or weight it needs to support. Next is a five-centimeter layer of support memory foam that is plush and luxurious; giving the mattress that added oomph that thinner counterparts miss out on. Deep contouring support—pressure relief without the feeling of sinking too deep into the mattress—is thanks to this layer. The one-and-a-half-centimeter sixth layer is made of denser support memory foam, which further bolsters what the previous layer sets out to do. The added density helps to keep your body aligned and your spine cradled properly—no matter what position you sleep in. The seventh layer is 20 cm thick and houses the DreamCloud’s patent-pending BestRest coils in between two heat-treated cotton pads. Each micro coil in the five-zoned compression system is pocketed; meaning it’s encased in DreamCloud’s unique memory foam. These BestRest coils a perfectly spaced so as not to trap heat, and their flexible nature allows for pressure relief and absorbs motion transfer without eliminating that touch of bounciness that the natural latex layer provides. The last layer is 4 cm of high density memory foam that acts as the foundational layer, supporting the entire mattress; which in turn supports you. Like the support foam layers above it, this layer helps keep your body and spine aligned; and like the top layer, right next to this is a fire barrier. DreamCloud offers free shipping and handling within the contiguous US states. Orders that need to be shipped to Alaska, Hawaii and other US territories will come with additional fees. DreamCloud mattresses come with a 365-night sleep trial, an Everlong warranty, and some free services you can avail of past during ownership: one professional cleaning worth $300 past the first year owned, and a one-time like-new reconditioning of the cover or support materials past the fifth year. 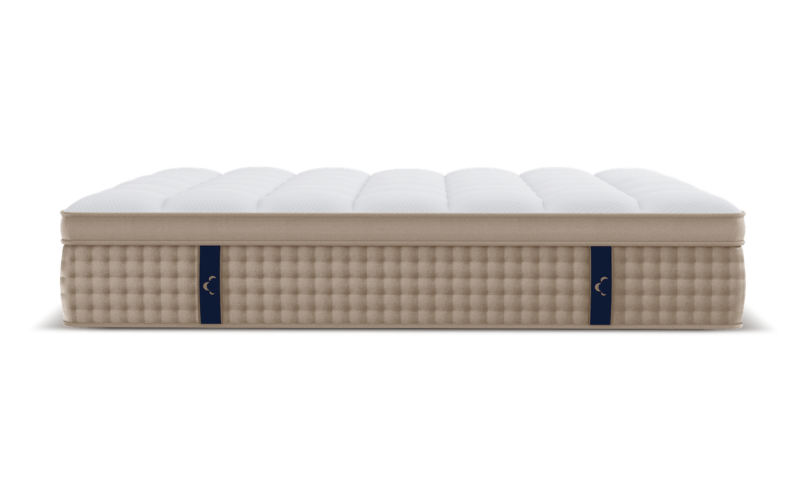 The DreamCloud mattress comes in six standard US mattress sizes: twin, twin XL, full, queen, king and California king. Its firmness is rated by the company as a 6.5 on a scale of 10, or “luxury firm”—also known as “just right”. The cashmere cover as well as all foams and latex within are hypoallergenic, too. The DreamCloud mattress is heavier than other online mattress offerings, though not enough to make it unwieldy. For example: the queen-sized DreamCloud mattress is 95 pounds; well over typical “bed in a box” counterparts that often sit somewhere between 70-80 pounds, but understandably so because of its unusual thickness of 15 inches. As this is a luxury brand, great care is taken to ensure quality and elite craftsmanship; you can rest easy knowing that DreamCloud mattresses are made with almost excessive attention to detail, and are worked on in small batches. 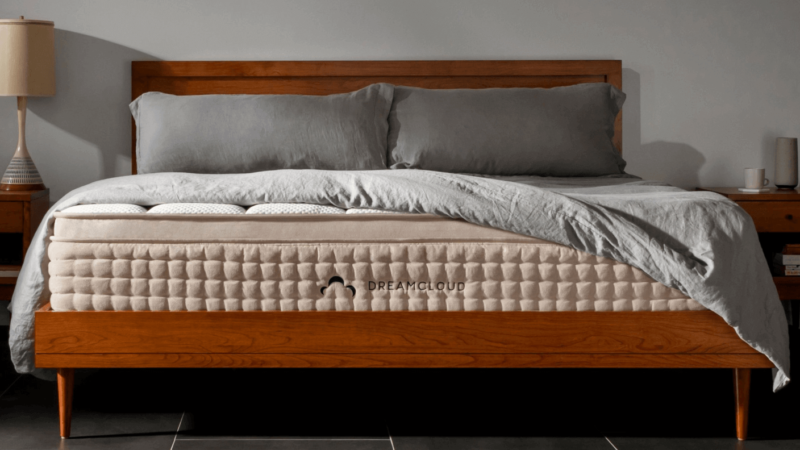 Important to note: as they are produced in small batches, certain sizes of the DreamCloud mattress may be listed as unavailable on their official website for periods of time. What Can Be Used with the DreamCloud Mattress? You can do whatever you want with your own mattress—obviously—but with the extremely long sleep trial period and lifetime warranty, it’s a good idea to make sure that you don’t do anything to void any guarantee given by the company. Here’s what it says on the Everlong warranty that comes with every DreamCloud mattress: “Your mattress must be used on an appropriate base such as a platform bed or other suitable bed frame.” Here at Good Night’s Rest, we think that it’s pretty clear that you need a bed frame—no putting this mattress directly on the floor! There’s also a DreamCloud adjustable frame that you might want to check out, although it comes in only five sizes— twin XL, full, queen, king, and split king—and a shorter sleep trial of 100 days, compared to the mattress sleep trial that spans a year. This high tech adjustable base from DreamCloud boasts of programmable memory settings, built-in USB plugs, a wireless remote, and more. You can even get it to give you a massage! It’s about the same price as the DreamCloud mattress, though; so buying both at the same time may not exactly be a budget-friendly move. How Easy Is It to Set Up the DreamCloud Mattress? You can leave it up to DreamCloud and opt for the White Glove Delivery service—which will take care of disposing of your old mattress, too, should you need that to be done—but it will cost you an additional $169, if it’s available in your area at all. Otherwise, it’s as easy to set up as other “bed in a box” mattresses. DreamCloud mattresses are direct-to-consumer but don’t actually come in a box; instead, they come in a reusable bag. Just unzip, unpack, set it on top of your bed base or frame, and let it breathe and decompress. There are handles at the sides of the mattress, should you need the extra help to adjust them on the bed. Yes, there may be a new mattress smell, but this will dissipate shortly—even faster with proper ventilation. There is no weight limit listed on the official website, and when we asked their customer support team about this omission, they confirmed it wasn’t an oversight. The DreamCloud mattress really does have no weight limit, in part due to the plushness of the materials and the thickness of the product. The company’s patent-pending five-zoned pocketed coil technology has a lot to do with this, too. 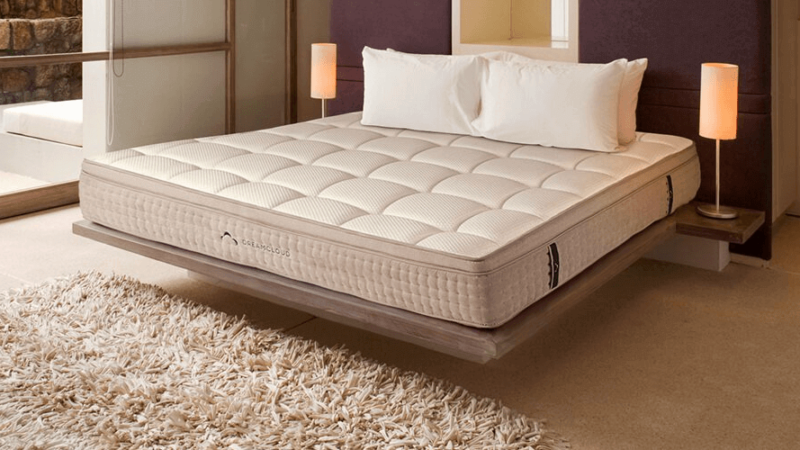 Because the micro coils provide a lot of targeted flex and compression—different in each of the five zones, most likely—weight distribution is better that it would be in all-foam mattresses, without being as bouncy and unforgiving as all-spring mattresses. 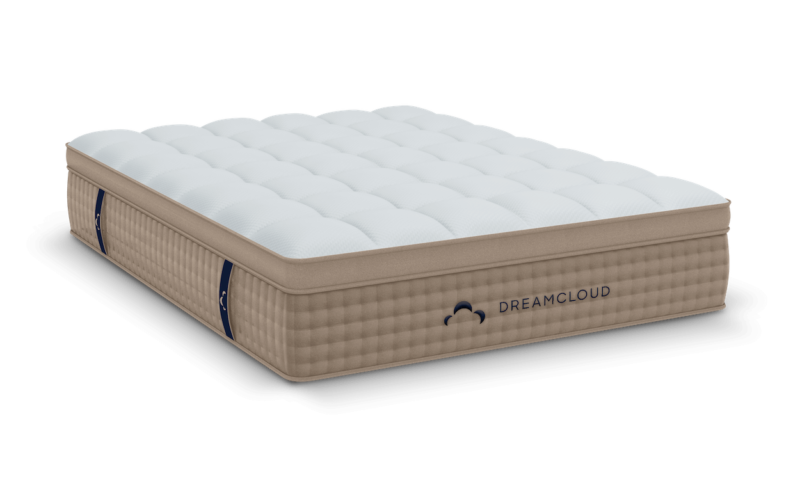 If you’re looking for maximum pressure relief without maximum sinkage, or strong support for a lot of weight, DreamCloud could be your luxury option. How Does the DreamCloud Mattress Feel? DreamCloud designed this mattress for sleepers to feel like they’re sleeping on a cloud, and for the most part—judging by the numerous positive customer reviews—they’ve been successful. Customers report a floating, almost weightless feeling, pressure relief beyond compare, and just the right amount of bounce to get in and out of bed easily. A great added feature is the foam-lined sides of the cover; the extra edge support is appreciated. Here’s the promise: A luxury hybrid mattress for a price comparable to most “bed in a box” products, delivered to your doorstep; with no weight limit, a year-long sleep trial, and a lifetime warranty. Honestly, it sounds a little too good to be true! Good thing that trial period is long enough to test the product thoroughly. Potential is, of course, as high as the promise is enticing. DreamCloud is new; and though this is usually detrimental to both promise and potential—simply because of no track record to fall back on—the brand seems to have used it to their advantage, learning from the mishaps and obstacles faced by other online mattress brands in the past. All the information you need is available on their official website, they have multiple avenues of customer support contact, it’s always clearly marked in the online store when a certain mattress or adjustable frame size is currently unavailable due to lack of stock. Couple that with the sheer amount of master craftsmanship and premium materials that seem to go into every single mattress, and you’ve got a product that certainly feels like luxury that even the most pragmatic person would be glad to spend their hard-earned money on. We love mattress companies that go the extra mile, and DreamCloud’s design—eight layers, patent-pending technology, unique foams, hand-crafted elements and all—really is above and beyond what you would expect from something you can simply order online and return within the trial period. As far as customer support goes, DreamCloud states that their Sleep Concierge Team is available every day from 6:00 AM to 9:00 PM PST. There is a live chat option, as well as a telephone hotline; and should you want to contact the team outside business hours, you can even email them through a contact form or a provided address. DreamCloud offers what seems like a lifetime warranty, although the Everlong Warranty is likewise more of a branding tactic than an actual definition of the mattress warranty you do get. Like many other warranties in this industry, the Everlong Warranty is not applicable to normal wear and tear or accidents. The amazing 365-night sleep trial, though, is absolutely real. If at any point before the end of the trial period you change your mind about purchasing the DreamCloud mattress, a return can be made free of charge and no questions asked. Your payment will be refunded 100% on the day the mattress is picked up. As of this writing, a queen-sized DreamCloud mattress is $1,199 on the official website. You can also opt to break up the cost and do six interest-free monthly payments—no credit check required! As previously noted, White Glove Delivery costs $169, and additional shipping fees apply if you’re purchasing this mattress from outside the contiguous US states. The DreamCloud mattress is very new, which means that most reviews—even this one—don’t benefit from long testing periods. However, because we’re familiar with DreamCloud’s parent company, there’s a measure of reliability and quality that’s already built in. The generous sleep trial and warranty periods, as well as the financing option, also do a lot to ease our mind and diffuse the worry that comes with the admittedly higher than average price tag for a “bed in a box”. To receive a luxury hybrid mattress at your doorstep is pretty convenient, though; no more long waits and tired spiels at showrooms! If you’re in the market for a mattress that’s a step up from the usual e-commerce driven foam mattresses—but don’t want to spend extra time, legwork and effort—the DreamCloud mattress could be your best bet. And, should you find that the mattress isn’t compatible with your needs, the sleep trial and free returns ensure that you’ll never be stuck with a bed you don’t like.